Last year I did a comparison post between two great Fresh Hopped IPA’s from BC. In honor of that I have brought both beer back this year for a repeat comparison. 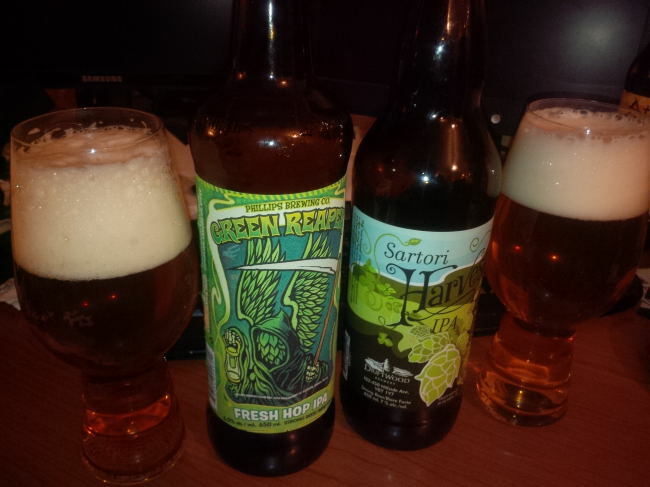 The two beer being compared are as follows: Driftwood Brewing – Sartori harvest IPA and the Phillips Brewing – Green Reaper Fresh Hop IPA (last years review) both out of Victoria BC. I sampled these two beer side by side out of IPA Glasses. Unlike last year these two beer poured noticeably different colours this year. The Phillips Green Reaper poured a dark copper colour with an off white head. The Sartori Harvest poured a light golden/copper colour with a white head. Regardless both looked very tasty. The aromas continued with the trend of differences although both were obviously fresh hop IPA not regular IPA’s. The Green Reaper had aromas of malts, citrus, mild grapefruit and a very fresh earthy floral hops. The Sartori had aromas of Malts, lemon and mild floral hops. Both smelled great but one was just a little better on the nose. The Sartori harvest flavour has had a huge change this year. The beer tastes thinner I don’t know how else to put it. The Green Reaper on the other hand seems to be quite similar to last years version. the Sartori tastes of malts, caramel, citrus, with a pretty big wet hop and earthy note. The Green Reaper tastes of strong hops bitterness, malts, pine, lime and some grassy notes. This year it was hard to pick a beer that I liked more as they were almost on different sides of the spectrum of wet hopped IPA’s. I almost want to say this is a tie as Sartori has changed so much and I am not sure if it was for the better. These two beer used very different hops varieties. 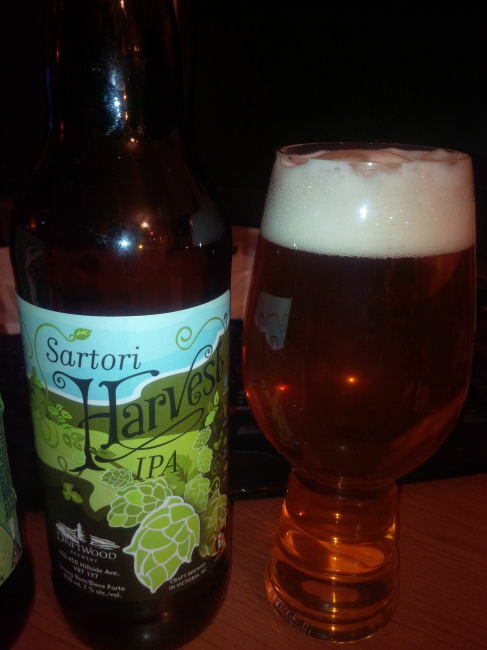 The Sartori harvest uses fresh Centennial Hops which gives off floral and citrus characteristics with a medium to high bitterness. The Green Reaper on the other hand uses a fresh Cascade hops which has a low bittering value but has aromas of flowers, citrus, spices and grapefruit. I don’t know if the harvest this year just didn’t have the oils that last years hop crop had but the hop flavour of the Sartori just wasn’t as prominent this year. 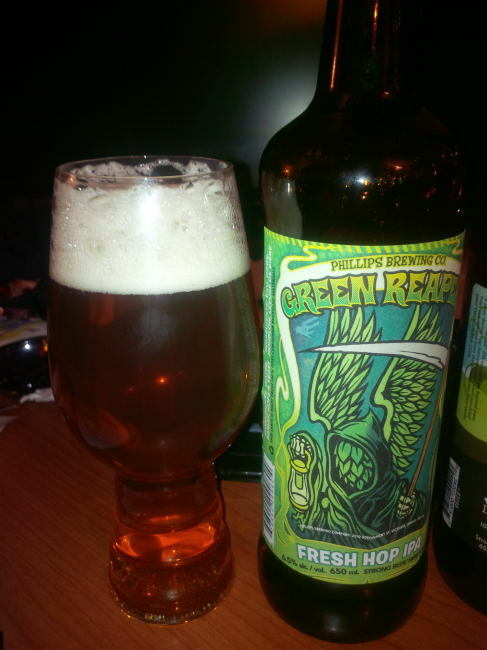 The Green Reaper was similar to last year where there was lots of flavour to the hops but not as much in the aroma. Winner: The Drinker! Both beer are great as always and both were equal in my books. Last year Sartori Harvest was the far superior IPA but with this years batch there just isn’t a big difference in the brews. Both have very different aromas and flavours but neither are Superior to the other. This is only my opinion though and you will have to make that decision for yourself. At least with Green Reaper not being on the same status to many you can still find Green Reaper in Stores. Sartori Harvest was sold out as it hit the shelves. This entry was posted in India Pale Ale and tagged 2013, bc, beer, bitter, bitterness, canada, Driftwood, fresh hop, fresh hopped, green reaper, hops, india pale ale, IPA, phillips, sartori harvest, victoria. I am not a big fan of the Reaper’s grassy flavor. Thanks I will fix that mistake. Good idea, did you happen to get your hands on some Hoyne Wolf Vine? They are the third Victoria-based brewery that got on that train. Really? Now that seems odd.